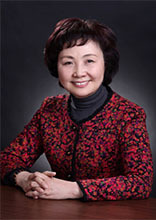 Dr. Hongyang Wang is director of the International Cooperation Laboratory on Signal Transduction of the Eastern Hepatobiliary Surgery Institute in Shanghai. She is also is director of the National Center of Liver Cancer. Her work focuses on molecular mechanisms and translational medicine of tumors, and she has made significant contributions to the molecular mechanism of tumorigenesis, signaling network regulation, and novel liver cancer biomarker screening. She is a member of the Chinese Academy of Engineering, member of the Academy of Sciences for the Developing World, and has won the National Awards for Science and Technology Progress (Innovation Team Award) in 2013, AMOREPACIFIC Award for Outstanding Women in Sciences in 2010, National Natural Science Award (Grade II) in 2006, Science and Technology Award of HLHL in 2004, and Shanghai Medical Science and Technology Award in 2003 and 2008. © 2019 American Association for Cancer Research (AACR) All Rights Reserved.